After working with one of my favorite saxophonists and human beings, Dan, on many projects including my own big band CD's, it is a pleasure to hear him with his own project breathing fresh life into 10 great standards. His expressive quality on the alto saxophone gracefully embraces these beautiful melodies. "Voicing a Standard" includes a great supporting cast including Jim Cox, Michael Valerio and Vinnie Colaiuta. Bravo Dan, for such a fine jazz CD that will live on for years. 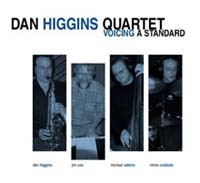 Over the decades we've had a number of truly inspired masters of the alto saxophone and as this recording will attest, Dan Higgins has secured a very high place in the pantheon of greats. He's an artist of extraordinary taste, range, and power and making music with him on recordings or in concert has always been a privilege and a joy for me. Within moments of the opening strains of Dan Higgins' distinctive alto saxophone sounds on the leadoff selection "When Sunny Gets Blue", his message is apparent. A firm advocate of the primacy of the inherent beauty of melodies, Dan's crisp yet warm interpretations reveal his high values for musicality. His goal orientation and outlook for his quartet's snapshot slate of tunes is appealing to the ear-witnesses as he infuses the tunes with joyful freshness.